Girls, you HAVE to check out style.com’s fall shopping guide! Why? International Fashion Influencers like Anna dello Russo, Garance Doré and Rachel Zoe reveal what’s on top of their shopping list for the new season and share their favourites in a beautifully edited guide. My personal highlight is Viviana Volpicella’s choice, whose cool Italian style I simply ADORE. 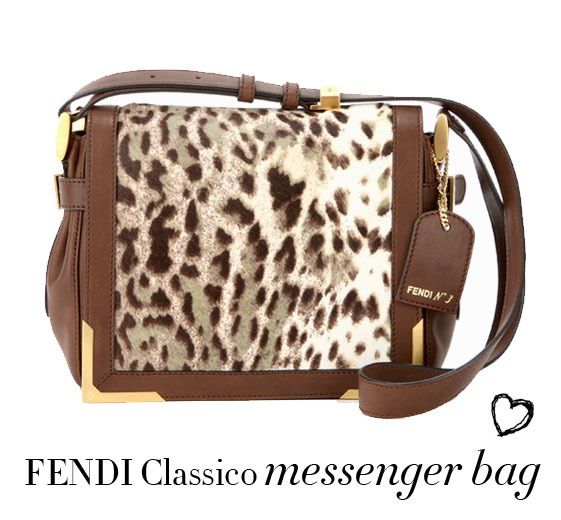 One of Viviana’s picks for fall is this super-cute leopard messenger bag from FENDI. I really can’t wait for that bag to hit the stores! It’s gonna be my fast-track to cool for any plain outfit. Here’s one of my favourite Viviana outfits. A beautiful lace dress set off with a cool military parka, YSL sandals and the gorgeous Prada plastic clutch. So simple, so cool! Her signature style includes Rayban Wayfarers (I’ve actually never seen her without) and a pop of color. Viviana Volpicella knows good style;-). Be inspired! Pics via style.com, The Sartorialist and Garance Doré. Thanks, Sylvia! I didn’t know this was a Vanessa Bruno blouse…So gorgeous!